"Having new sounds at my fingertips is always an inspiration and these new PLAY plug-ins have plenty of great sounds to choose from." "I am a big fan of the EastWest / Quantum Leap libraries. Their collections contain generous sound palettes with great attention to detail. I am also very impressed by the power of the PLAY engine." SD 3 Features the best instruments from the private collection of Mickey Hart. Features additional instruments from the Remo private collection, hand picked by Remo himself. Played by master percussionists Mickey Hart, Greg Ellis and Chalo Eduardo. Produced by Nick Phoenix, "Two Steps From Hell" composer and creator of Stormdrum 1 and 2, epic percussion collections. Includes 5 user-controllable mic positions for each instrument. Recorded in the world famous EASTWEST Studio 1, the home of major Hollywood soundtracks and television themes. Includes new PLAY 4 64-bit/32-bit software on both MAC and PC, more user control and detail than any other collection. 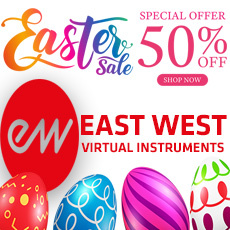 Stormdrum 3 is the first virtual instrument to include EastWest´s new PLAY 4 software. In PLAY 4, EastWest replaced some third party components; added Avid´s new AAX format that will allow Pro Tools 11 users to use EastWest´s virtual instruments 64-bit, greatly improving performance; added new time-stretch software optimized for loops (with sync to sequencer); added a new mixer page (with sub-channels for mic positions), added background loading, and other new features. To top it all off, EastWest now offers SSL FX from Solid State Logic, the industry leader in mixing technology; and an upgraded "true stereo" EastWest reverb. The new SSL/EW FX package is included FREE for SD3 users. The FX section includes a SSL EQ and Dynamics Channel Strip, Transient Shaper, and SSL´s legendary Stereo Bus Compressor; plus an upgraded "true stereo" reverb from EastWest plus new features. Now, with it´s combination of the new PLAY 4 software, the best sound processing tools available, and world class percussion instruments, Stormdrum 3 is the most advanced percussion virtual instrument to date and a must-have. Big Drums: These are the larger drums that do not fall in the Taiko family. Many of them include large, deep and booming sounds, but others are more complex in nature. There are some real gems in here from Mickey´s magical warehouse of one of a kind hand drums. Highlights in the epic genre here are The Beast, Double Headed Tree Drum, Lord Of Toms Ensemble and Dragon Ensemble. Gongs Clocks Waterphones: These instruments provide the iconic sounds of several gongs and waterphones, some played underwater! The "Clockworks" patches are the result of Nicks field recordings in 6 antique clock shops. Small Drums: Here you´ll find a very large collection of smaller drums. Some have names you´re probably familiar with, such as bongos, frame drums, and tambourines. But there are so many others that will surprise and delight you. Many of the Indian drums in this category are particularly special, such as the tuned tablas and madal. Performance techniques are stellar. Taiko Family: This collection includes taiko drums ranging from huge to small. Many of the sampled instruments came from the collections of Mickey Hart and Remo to create a wide variety of sounds. Others came from the top taiko builders in Japan. They are played both individually and in ensembles. This is the Holy Grail of taiko samples. Finally. Woods: In this group you´ll hear unpitched sounds from wooden resonators; tuned chromatic instruments, such as a gourd marimba and a balaphone; the mighty gourd drum, a playable 12 ft. long redwood tree branch and wonderful scraped sounds, such as the Thailand frogs. Huge Collection of Drums & Percussion from Soundiron! 250 Traditional and unusual percussion instruments! All things considered, SD3 is an impressive package, and a music tool that will grace many Hollywood soundtracks for years to come. "We've never come across a more expansive collection of massively multisampled drums"
Great sounding samples! Suitable for any kind of music production, from epic cinematic soundtracks, epic trailers to pop, jazz, etc. Imagination is your only limit with this percussion library! Best value for money for sure! I like SD2 and the successor to the fabulous library is also quite good. Audio quality is fine and professional and it has a broad range of goodies. But if you look for a big bang percussion you should go to other libraries like Heaviocity stuff. There is only one patch for big Hollywood percussive sounds. Most instruments are generic percussions for standard use rather than exclusively cinematic big sounding percussions. So that is the one thing I thought this library is short of. This is Storm drums library but this time there is not much storm. And I found the every patch's output level is set too low. I think it's not proper level setting of samples, though basically most samples are recorded in good quality. All in all, SD3 is not as impressive as SD2 but still it's highly usable, fine library to own.